There are many ways to find inspiration for cakes, whether baking yourself or looking for that perfect design to get made. It can be an old photo, a TV programme (My guilty pleasure has to be Ace of Cakes and Cake Boss – but sometimes just watching them can make you go “oooooooh thats a good idea for doing that”) magazines, the internet or just good old fashioned talking to people. There are many publications around today, and most of them available in your local super market, but my favourite is Squires Kitchen Wedding Cakes – a design source. 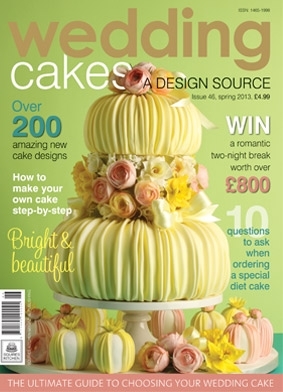 It has loads of ideas and some little tutorials for the statement cakes in that issue. Sometimes its nice to know how other people are producing the same thing as you but in a different way. Most magazines are around £4.99, which I think is a little expensive when you can get access to an infinite number of images on the internet. Which leads me to my favourite place of cake inspiration…. You guessed it, Pinterest! I find the range of ideas and tutorials around on the internet so useful, sometimes just watching a youtube video or finding an interesting image on pinterest or google can give you a new idea for a cake or a different technique to try. I love to experiment and develop the techniques I can do on cakes. I have a dedicated “cakes” board on pinterest, that I think has over 400 cake images and ideas on, feel free to have a look through and follow, I am always adding more to it.